Space is cool. Sending stuff to space is cool. Studying space is cool. Telling stories about space is cool. And booze is pretty cool, too. So why—tell me, really—am I so thoroughly underwhelmed by the idea of Ten-Forward Vodka? There are much, much bigger Star Trek fans out there, but I am a Next Generation girl through and through. 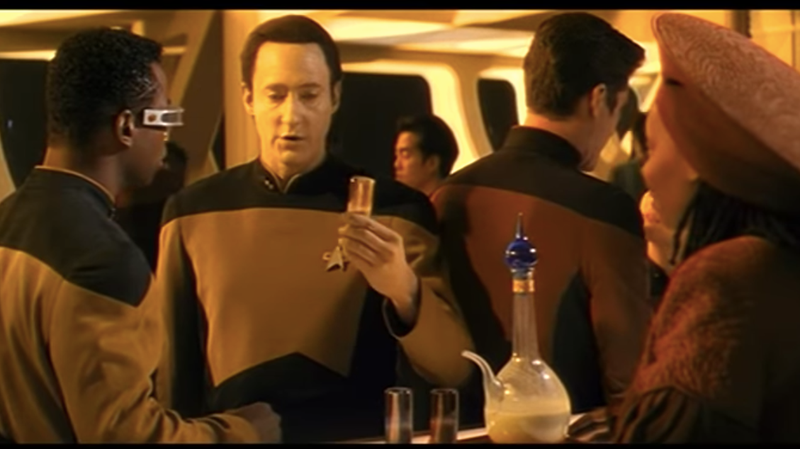 When I was growing up, I always loved the scenes in Ten-Forward, the lounge where all the drankin’ and some big feelings were likely to happen. I also loved Whoopi Goldberg, and cool hats. As mentioned above, I love space. And I love spirits. And I love cheesy marketing ploys. I am an extremely easy mark. To cap it all off, this bottle’s suggested price is $29.99. which is pretty darn good for space vodka. And yet, I am still less than enticed. Get back to me when Chris Hadfield un-retires, builds a still in space, makes potato vodka, sings a song about said vodka, and return said vodka to earth. Then I’ll be excited. That is an extremely vague description. Get it together, novelty spirits world.